Vehicles were directed onto U.S. 501 in Myrtle Beach, S.C., Tuesday. The state government ordered traffic to use all the lanes on the route leading away from the coast to facilitate evacuations ahead of Hurricane Florence. Many seaports and airports along the southeastern U.S. coastline have been shut down, more than 1,000 flights have been canceled, and some highways and bridges in low-lying coastal areas could close soon, as Hurricane Florence gets closer to making landfall. Authorities in coastal areas that lie in the path of the massive storm are urging residents one last time to evacuate. South Carolina Gov. Henry McMaster's message is pretty blunt: If you live in an evacuation zone, hit the road soon. "Once those high winds get here ... it will be very difficult, if not impossible, for anybody to come rescue you if you are in harm's way in one of those zones," McMaster said at a news conference Wednesday. Authorities reversed the flow of traffic on the eastbound lanes of many highways to help residents evacuate and move inland more quickly, and that will continue in some areas for a while Thursday. 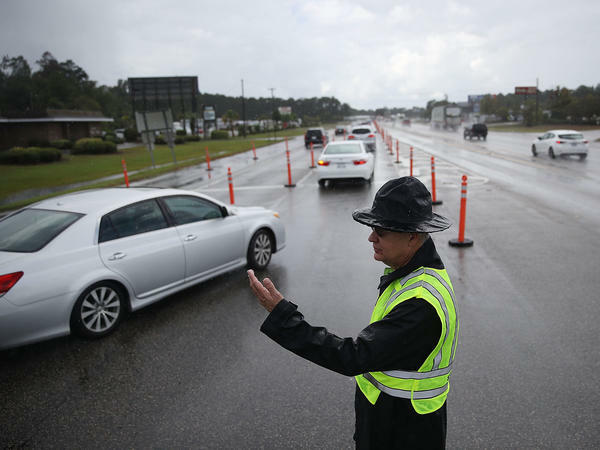 "The traffic control points or lane reversals are still in effect," said Joseph Hill, police chief in Horry County, S.C., at a news conference Wednesday in Myrtle Beach. But, Hill added, those lane reversals will end soon: "At that point, they'll shut 'em down for the incoming storm." In South Carolina, Gov. McMaster says at least 300,000 people have already evacuated. But Hill said many residents still remained in their homes, possibly hoping to ride out the hurricane. "You need to get out now," Hill told those who were staying behind. "We will not be able to respond to you when the winds get so high." "So if you're in trouble, you're on your own," Hill added. For some residents, evacuation plans were hampered by gasoline shortages. 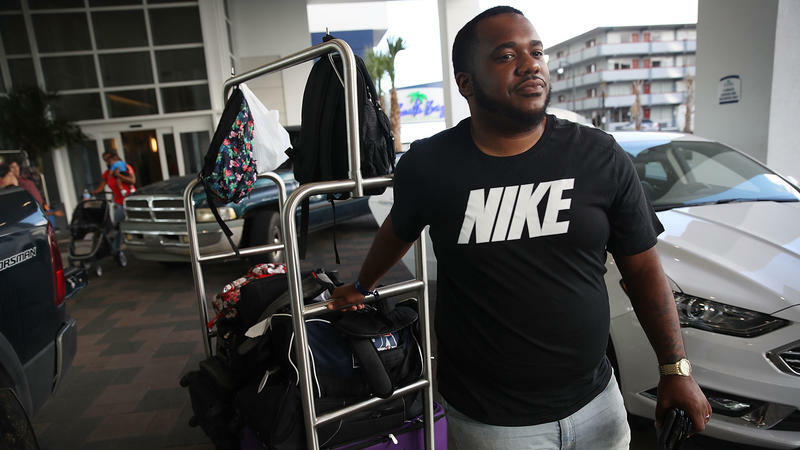 "There was no gas yesterday," says Rebecca Segool of Wilmington, N.C. "We sat in line for like a half hour at like five gas stations to get gas." A significant number of gas stations, especially around Wilmington and the Raleigh-Durham area, were running out of fuel because of huge demand, according to Patrick DeHaan of the fuel price tracking service GasBuddy.com. "Simply put, when you have tens of thousands of people that are trying to get out of harm's way and they're all filling up at the same time, certainly it overwhelms how much gasoline can be stored ... at gas stations." DeHaan says there's plenty of supply at regional gasoline storage facilities, but the urgent need is making it difficult for tanker trucks to refill and then resupply gas stations. "Sometimes tankers have to wait in line for hours to refuel their 10,000 gallon tanks," he says. "There are kinks in the chain and that causes stations in the meantime to go dry." DeHaan adds that a shortage of tanker trucks and drivers contributes to a gasoline shortage, though he says some bigger companies are moving trucks and drivers into the region to help meet demand. 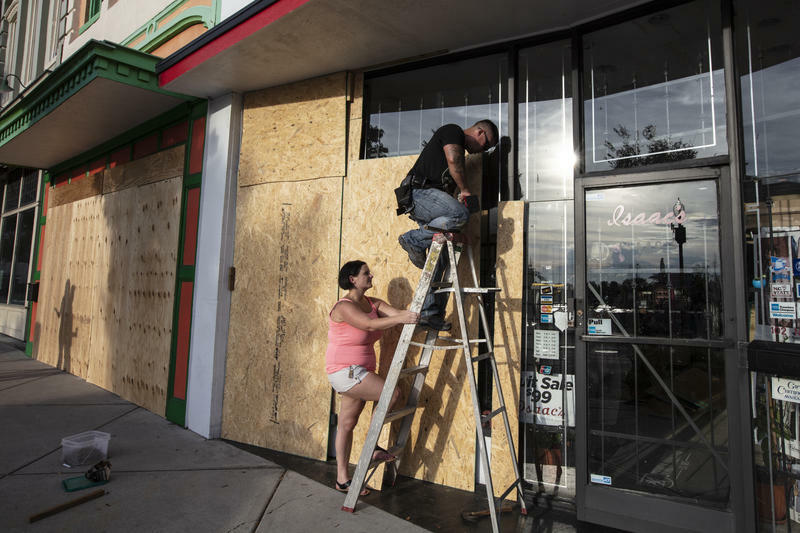 The hurricane is exposing other chinks in the supply chain, as many retailers big and small are running low on storm-prep essentials, from batteries, generators and plywood to bread and bottled water. Trucks are rushing into the region to restock store shelves, but Peggy Dorf, a freight and logistics market analyst for DAT Solutions, says they won't be for much longer. "As soon as a storm is about to hit, all traffic stops in and out of the area until the storm calms down and the roads are clear," she says. Clearing the roads of hurricane-blown debris could take a couple of days or even weeks, says Dorf, depending on the severity the storm. "You could have a delay when power is out, bridges could be out, roads could be flooded and you won't be able to deliver goods and materials for reconstruction," says Dorf, "or for that matter, clean water and food and other important supplies like batteries." Dorf says trucking companies and logistics firms are working with FEMA and state and local authorities to park trucks full of goods and materials needed in the recovery in temporary warehouse and staging areas just out of the path of the hurricane, so they can quickly move into affected areas once the storm clears. Air travel could be all but stopped for several days, too. "We currently have a travel alert which has been posted for 23 airports from Virginia all the way through Georgia on the East Coast," says Ross Feinstein, spokesman for American Airlines. Some airports are already closed, others may cease operations Thursday, and American and other airlines are moving their planes to higher and drier ground. "They're very expensive pieces of machinery and high-tech aircraft that we do not want to have near any type of storms with high winds that could possibly damage that equipment," Feinstein says, adding that local airport authorities also don't want airplanes left at gates or on the tarmac when the hurricane hits, because they could add to damage and debris and hinder cleanup and recovery efforts. Feinstein notes that with the hurricane's change of direction to a more southerly track Wednesday, it appears Florence no longer poses a threat to Charlotte, one of American's busiest hubs, minimizing the impact on the airline's operations there. Still, there are several other North and South Carolina airports in the storm's path. American, Delta, Southwest, United, and others will likely be canceling hundred more flights through the weekend. When flight operations can resume will depend on how long Florence sticks around, and forecasters predict it could sit and drench areas of the Carolinas with a deluge of rainwater over a couple of days. "That is a concern our team of meteorologists has — if it stalls and how much rain could possibly fall within a certain period of time," says Feinstein, adding concerns that there could be "massive flooding of runways and other infrastructure." If the rain forecasts hold true, it could take some time for not just planes, but cars, trucks, trains, and even some emergency vehicles to return to the hardest hit areas. For the latest on Hurricane Florence, visit NPR.org. In Charleston, S.C., a major interstate is reversing direction for about 100 miles, sending every lane inland — even earlier than originally scheduled. In the Outer Banks, N.C., where tourists and residents rely on a few bridges and ferries for access to the mainland, authorities are warning residents to get out immediately. The state's governor has taken the unprecedented step of issuing a state-level, mandatory evacuation order, instead of relying on local governments. 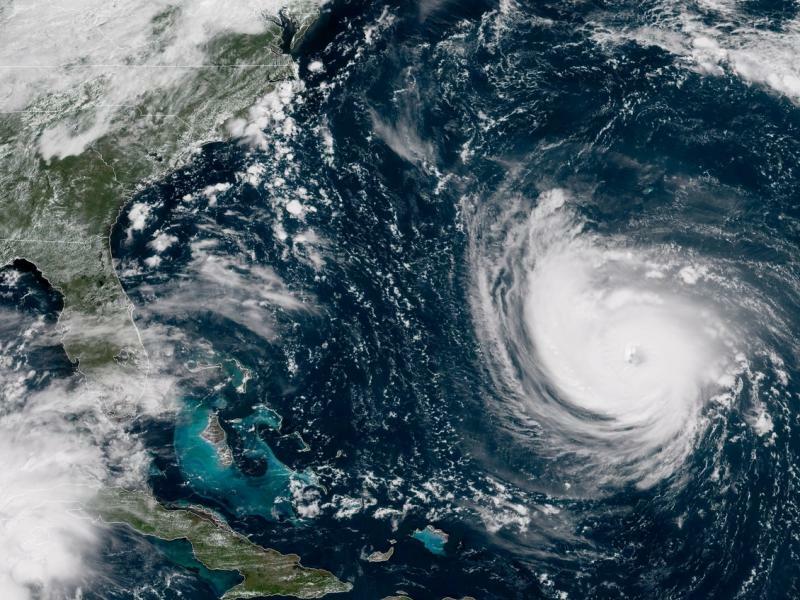 The severity of Hurricane Florence, a Category 4 storm, is intensifying and triggering hurricane warnings along the coasts of the Carolinas, the National Hurricane Center announced in its 5 a.m. Wednesday update.